The basis weight and moisture-measuring system GrammageScan LMS XS by Döscher Microwave Systems industry has proved itself over years in industrial foil production lines. To apply this exact, reliable and fast messure technic in way smaller productions, we had to minimize the linear motion unit and the sensor. We created the fivefold smaller GrammageScan LMS XS. 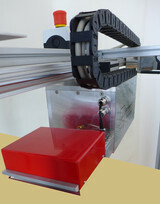 The sensor, running on a two parameter microwave resonance technology, drives with a linear unit over the production line. It identifies automaticly the boarder of the paperline and stopps to begin with the measurement. In regularly intervals it moves out of the paperline to refresh the zero measurement without any products between to ensure a sustainable precision. If the paperline breaks the sensor automaticly moves back to the parkingposition immediately. 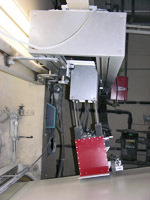 The measuring system is constructed to work 24/7.